When the ten lepers were healed, how many came back to give thanks? 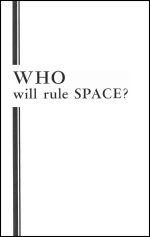 The first nation to conquer space will RULE THE WORLD! The startling answer is revealed in prophecy! TODAY - you live in the SPACE age! In just the past few short years, the startling accomplishments of science have hurtled this world through the machine age, into the atomic age, and now to a position poised on the brink of SPACE FLIGHT - the space age! Western military leaders are frankly frightened. They warn America dare not discontinue the testing of nuclear weapons, lest we lose the present arms race by default. Others seriously warn that unless all nuclear testing is stopped IMMEDIATELY - we are headed toward mutual annihilation! But far overshadowing the arms race, the actual stockpiling of nuclear weapons, is the race to put a MAN in space!